New Brunswick, N.J. – The Rutgers Equine Science Center released its “2019 State of the New Jersey Horse Racing Industry” report which found that New Jersey racehorse owners and breeders continue to remain non-competitive withNew York and Pennsylvania, where horse racing is subsidized by revenue from casino gaming. Director of the Rutgers Equine Science Center, Karyn Malinowski, Ph.D., utilized the same indicators developed in the 2014 report to provide an eight-year timeframe in which to examine these data points. These indicators included purse monies awarded, number of race days, races restricted to state-bred horses only, mares bred and foals registered. They also reflect the willingness trainers, owners and breeders have to invest in horse racing in a given state. The new report also comes at a time when the State of New Jersey is considering allocating funds to the New Jersey Racing Commission that would be used for horse racing purse subsidies. NJ Senate Bill 2992 and NJ Assembly Bill 4810 were introduced in the legislature in 2018. “These indicators can be used moving forward to observe trends in the New Jersey horse racing industry as the state looks to invest in the horse racing segment of the equine industry with an annual $20 million appropriation (for a period of five years) to benefit purse structure at New Jersey racetracks and breeder incentive programs such as the New Jersey Sire Stakes Program in support of Standardbred breeding,” says Malinowski. 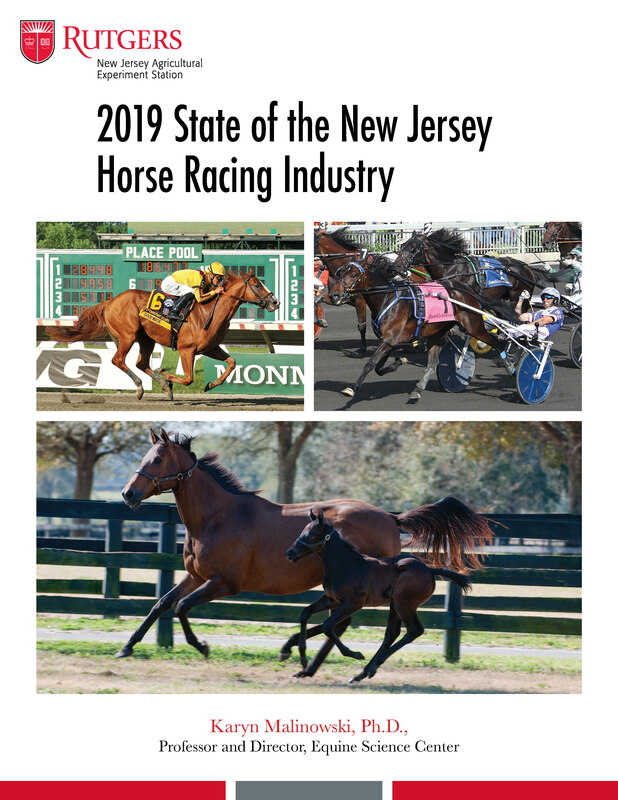 The 2019 report also includes the results of a 2018 survey of equine veterinarians in New Jersey conducted by the New Jersey Association of Equine Practitioners. The survey, which was compiled by the Rutgers Equine Science Center, “demonstrated that equine practitioners involved in the breeding of racehorses and its associated components have been negatively impacted by the reduction in numbers of racehorse foals being produced in New Jersey. An economic impact study of the New Jersey horse industry, conducted by the Center in 2007, found the industry to be valued at $4 billion (including racing and non-racing interests) and generating $1.1 billion annually in positive impact on the New Jersey economy.